Understand how you bot is used and leverage that data to improve the performance of your dataset. Refine your training through our log feed, by correcting when user sentences are misunderstood. Understand how your users are talking to your bot and improve the experience based on data. Understand your training dataset and enhance its performance with tips generated during your benchmark. API based: manage all logs in your back-end or through our interface. Instant training: train intents and tag entities directly from the log feed. Smart filters: specify the analytics you need to see by language, channel, date, or many other categories. Instant tracking: track the usage of your skills, intents or entities. Smart filters: specify the analytics you need to see by language, channel, date, or any other category. 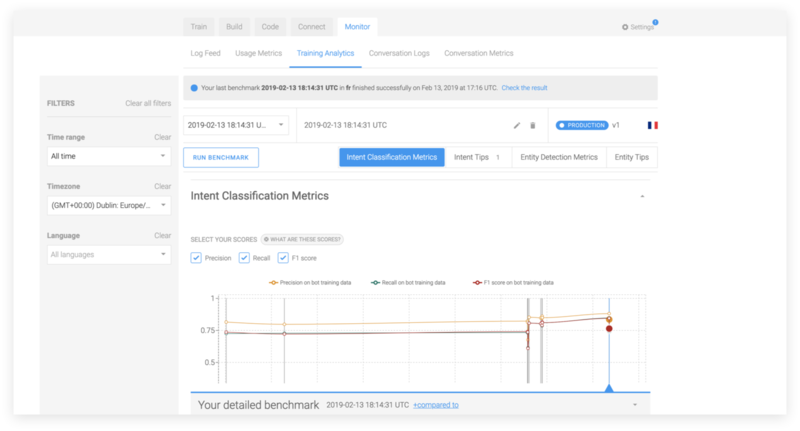 Automatic benchmark: assess the performance of your training dataset automatically. Data science metrics: get four metrics to understand the depth of your dataset performance. Live tips: get generated advice on how to improve the performance of your bot by improving your dataset. Use our Getting Started tutorials, API Reference and best practices to build your first bot! Our SDKs are here to make your lives easier by creating a layer of helpers on top of our NLP API. Many are available (NodeJS, Ruby, Python, PHP, iOS or Android) on GitHub! Our team is always happy to jump in and help you figure everything out.